Whitney Houston's mum has opened up about her daughter's death - saying she's angry she died alone. The I Will Always Love You singer drowned nearly a year ago in a bathtub at the Beverly Hilton Hotel at the age of just 48, following a battle with drug addiction. Cissy Houston, 79, said she is still tormented by her daughter's sudden death, People, which is publishing exclusive excerpts of her new memoir, Remembering Whitney, reported. "I'm angry she died alone, in those conditions," she said. "I'm still mad about that." 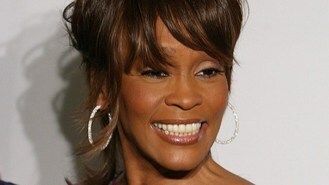 She said that when she tried to contact her, Whitney often didn't return her call. Cissy doesn't believe former husband Bobby Brown is to blame for her drug problems, but she is angry "for the way he treated her". She also writes for the first time about her daughter's relationship with female former assistant Robyn Crawford, who became her creative director. "I just didn't want her with my daughter," she said. "I know nothing about a romantic relationship. That's what everybody said but they didn't know either." Ed Sheeran has been busy - he's written almost 30 songs for his second album. Jahmene Douglas has got his own record deal. Justin Bieber's new song has apparently been leaked online. Tina Turner is on her way to becoming a Swiss citizen. Justin Timberlake's former N*Sync bandmates had no idea he was making his music comeback. Lady Gaga has confirmed she is making an album with veteran crooner Tony Bennett. Barry Manilow has been forced to postpone the opening night of his latest concert show on Broadway because of illness. Fun. lead singer Nate Ruess says the band's successful year has taught him "that I need to take better care of myself. Guns N' Roses guitarist DJ Ashba has defended Axl Rose, insisting the frontman is misunderstood.